In the 1980s telephony went digital giving customers a better, cheaper and more reliable service. In the 1990s telephones became mobile and the internet came along giving us the web and email. In the 2000’s smartphones combined the two so we have voice, web-browsing and apps all on personal mobile devices. You may have heard of 5G as the next change. 5G is coming, but what will this mean for the way we use our phones? As we move around in our daily lives sometimes we use 3G, other times 4G and occasionally GPRS (2G) or (aagh!) no data. This is due to the way our phones look for a connection which is a combination of the phone and available mobile networks negotiating in competition with other users for the best connection. This means the overall experience is pretty hit and miss which is not only sometimes annoying, but also means any service that needs guaranteed performance cannot be provided. Have you ever been running to a meeting using a map on your phone and run out of battery? Much of the intelligence in the services we use resides on our devices and require a lot of processing power which limits performance and time between charges. 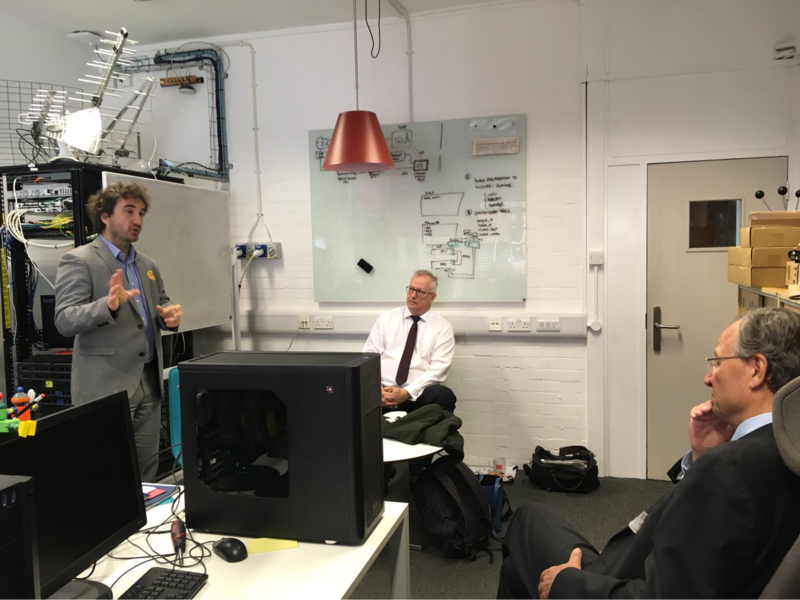 We visited the 5G testbeds in University College London to hear about the development of 5G and building smarter infrastructure in the UK. The really interesting part of 5G that not many people hear about is the 'orchestrator' function in the network. 5G networks understand what you are trying to do and, in the context of everything else going on around you, selects from the networks available to deliver what you need. This is a major change in how the network operates. So rather than competing for the same level of connection, 5G is a smart network. It tailors itself to your needs. There is a whole world of possibilities with 5G, for example autonomous vehicles could provide entertainment systems provided by the manufacturer. All of this is part of a programme being developed by the Department for Culture Media and Sport (DCMS). The IPA has helped establish DCMS’s 5G Testbeds and Trials Programme that will help the UK be among the leading nations in developing and deploying the new capabilities of 5G. IPA were instrumental in setting up the programme and led the first project supporting three universities to deliver the 5G UK test network - the first ‘orchestrator’ to deliver end to end services across different equipment. What might this lead to? 5G means the intelligence does not need to be carried around. The connection is managed externally from the device and processing is done in the network, so instead of having to use your phone, you could view content through a google glass type device and the battery could be in a shoe recharging as you walk. 5G is not only about personal devices but many processes and interactions that could be automated with the certainty of connection and verification of events. This will enable a whole new world of services, which, hopefully, the UK will lead in developing. Look out for further updates on the 5G programme on our blog site. Really interesting and look forward to reading more about the IPA involvement in this.